I can especially appreciate this one. I don’t even want to know what you’re implying. Well, I do, but that’s less funny to say that. One of the best I’ve seen yet! …Now he REALLY needs to hold his breath! … [#92]. Yeah, and finding that roaches nest under the fridge is pie now. zantarath. Think. How is he going to fit the rest of his body to get to the nest? 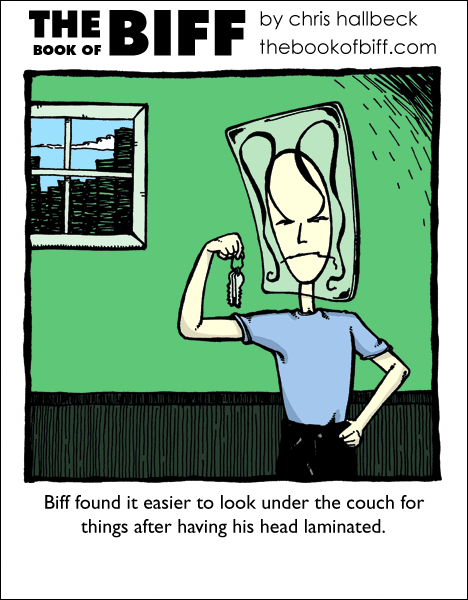 I say we all support Biff to get himself entirely laminated, that way he can never be squashed again. Of course getting cut is an entirely deferent story. He doesn’t need to buy bookmarks, now. Actually, in that Dexter’s Lab cartoon, Dexter laminated himself to stay clean. so now he can cut himself not only with orange peelers, but scissors too? (I’m reading the archive backwards… Just to be Biff). Awesome comic btw, definitely on my bookmark list. ……….why do I suddenly have the urge to borow my dad’s old laminator? thats useing your brain!….. but how does he breathe? He lost his keys even though he have hundreds next to the door…. O_______o Time to dust off my Mom’s laminator! Everyones parents have a laminator or two, they just haven’t told you yet. Trust me they will be vitally important when the time comes. *Laugh* That eyebrow style makes him look like a girl. Kinda. He no longer has a side profile! What happens when his eyebrows GROW? XD I mean, they never stop…will they just poke through the plastic? He’s been both stapled and folded AND laminated? I suppose all that’s left is spindling and mutilation. When I first saw this, I thought the couch had eaten him. Maybe that was the motive or the method for getting his head laminated.